Upper Deck announced today that Presidential Predictor cards of Vice Presidential candidates Joe Biden and Sarah Palin will be inserted in packs of their SP Authentic release. 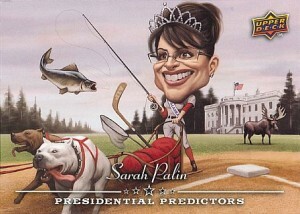 … while the Palin card depicts her as, uh, possibly unqualified to participate in the set. Or, if you prefer, in a league of her own and defiant of Upper Deck’s imposed stereotypes. Seriously, that’s the best they could do? Why not pick a Alaskan baseball player like Curt Shilling to mirror her after? He did, after all, support Bush in 2004 and has already endorsed McCain. Bloody sock, perhaps? How about Shawn Chacon? He was Alaska born and bred. Why not a card of her picking up Barack Obama (or Biden) by the neck and throwing him to the ground a la Houston Astros GM Ed Wade? Even better, why not use a player from the All American Girls Professional Baseball League? These were pioneering women making their mark on a male dominated game, much like Palin has this year, and most people have at least a passing familiarity with the AAGPBL from the movie A League of Their Own. 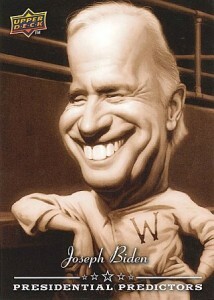 So while the Biden card looks nice, the Palin card looks, well, cartoony. I’ll leave you to impose your own judgements on Upper Deck.